Translating human anatomy into robotics is harder than it sounds. While scientists haven't yet been able to create a prosthetic that perfectly passes for a human limb, this new device designed by researchers at the University of Washington comes pretty close. According to Business Insider, this robotic hand is so accurate that it can practically mimic human dexterity. Researchers Zhe Xu and Emanuel Todorov created the mechanism by scanning an actual human hand and 3D-printing plastic "bones" using the data. The model's joint ligaments are made from a durable, plastic fiber, and 10 motors installed below the hands direct the movements of the tendons. To control it, the researchers designed a high-tech glove covered in motion sensors. The hand's movements are so precise that it's able to grab onto delicate objects like CDs, credit cards, and dollar bills. You can watch as the hand mimics the researcher in the video below. 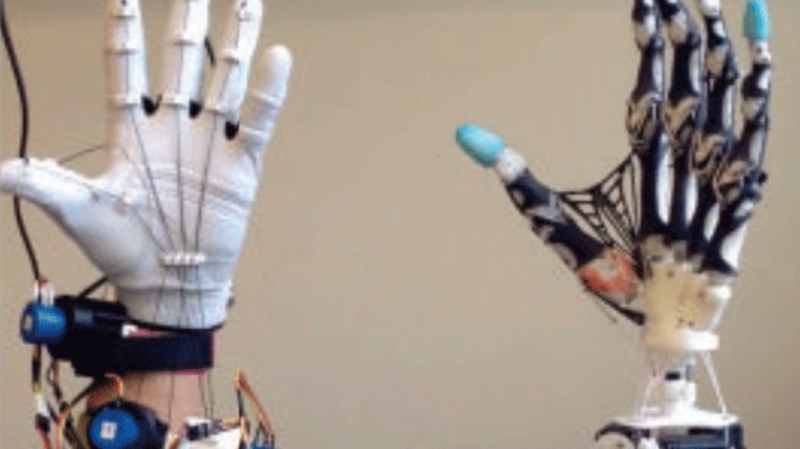 The Institution of Electrical Engineers' science and technology news outlet, the IEEE Spectrum, described the machine as "the most amazing biomimetic anthropomorphic robot hand we've ever seen." Its proportions are so accurate that researchers believe it could be used to grow actual human tendon and tissue, allowing for amputees to grow entirely new hands in the future. The technology could also be used in robotic prosthetics and even in space as a way for astronauts to make delicate repairs to the outsides of ships without having to don a space suit. Xu and Todorov recently released a paper detailing their work [PDF], and they also plan to present their findings at the robotics conference in Sweden this May.